When I had a brief chat with John Boyne last night after the World Premiere of the movie The Boy in the Striped Pyjamas, he seemed like a happy man. Having been given a standing ovation by the audience at Dublin's Savoy, his joy carried through to the lobby of the cinema where he was greeted and congratulated by contemporaries and fans alike. I'd first spoken to John at the Dublin Writers Festival this year, where on meeting him I gushed about the book. I'm a regular reader of his blog so knew he'd been on set and met the actors. Even back in June his enthusiasm for and confidence in the movie showed - the first movie adaptation of one of his books seemed to be to his liking. Last night as he spoke I got a real sense of accomplishment on his part. The glowing tribute from Ryan Tubridy who spoke before the movie told how the book's dedication came about - when John had finished the book he gave it to the young Jamie Lynch to read. 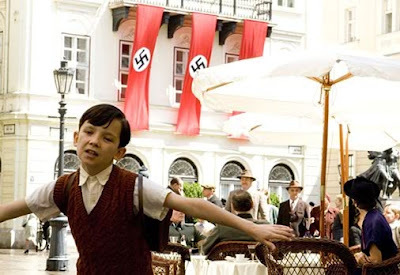 Being happy that this fable (as he describes it) was well received by children, the book was launched in 2006 and has since ascended dizzying heights of translation into 36 languages and now a movie directed by Mark Herman. Special thanks must go to Mark Herman who has taken something so important, something that has changed my life and has made it better". 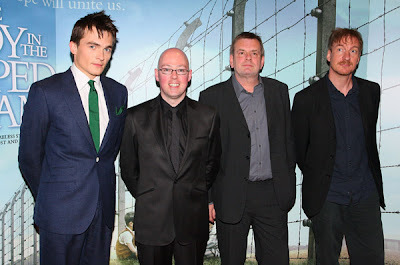 At the premiere also were the director, actors David Thewlis (Remus Lupin in the Harry Potter films) and Rupert Friend as well as many supporters of Amnesty International Ireland, for whom the premiere was a fundraiser. The movie certainly seemed well received, the only sound as the credits rolled being sobs and sniffles from audience members who found the ending quite emotional. As the last credits raised, the audience erupted in applause for a film that somehow deserved to be made, if only, as Tubridy said earlier, to "work on the eradication of the amnesia when it comes to this chapter of history". If you haven't read the book, I would strongly suggest not reading any further. As the movie is quite a faithful adaptation, any of the 'spoilers' below won't be surprising to those who have read the book, but may ruin it for those who haven't, and I would not like to do that for what is quite an unique and amazing novel. From the opening quote above and onto a Nazi decorated square in Berlin where little boys play aeroplane, you can tell that the film crew have put care into making this look good. With Miramax (owned by Disney) behind it, there should be no question of quality, but even as Trish Long, head of Disney Ireland said before the movie, adaptations of favourite books are normally approached with hesitation and trepidation. Not so here. The scenery, sets and uniforms seem authentic and there's a sense of care taken. The entire opening sequence in fact sets the standard for the rest of the movie. The rich shots showing the lavish German lifestyle is contrasted with the fear in the streets; maids cleaning a house in preparation for a party is shown alongside Jewish evictions taking place. The star of this sequence, and most of the movie is James Horner's powerful soundtrack, which swells and fades with the regularity of breath but catches and amplifies every emotion. I honestly believe that without this music, the film wouldn't have the same impact. You can hear some of this music on the film website. 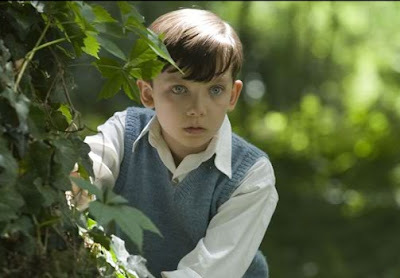 Just as the book revolves around Bruno, so the film revolves around Asa Butterfield. The child is remarkably well cast in that he looks, well, evil. Norman Mailer's last novel is a book about the young Hitler called The Castle in the Forest and I can think of no better actor to play the role than Butterfield. Throughout the film I'm constantly impressed and surprised by how believably he plays the role, which, though different from the Bruno I imagined, is powerful. While I have many issues with the English accents, the loss of certain features of the book and the supposed lack of knowledge about the war and Jewish situation of this son of a Nazi commandant, I can't fault the way Butterfield has made this part, his first major movie role, his own. Choosing to be ignorant is its own brand of badness and my dislike for the Bruno character in the book transferred nicely onto his screen character. 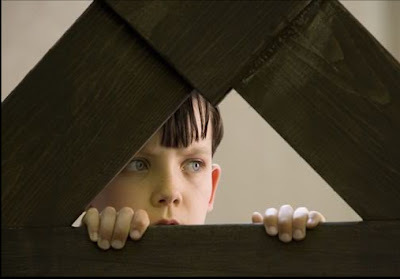 Equally Jack Scanlon is well cast as Shmuel, the likable, if not pitiful Jewish child. Time and time again I had to remind myself that is is a book and a movie for children more than adults, and as such had to supress my disbelief at how healthy he looked (despite the make-up) and how well spoken he was - but this seems to be true for him in real life too. In a recent interview the ten year old commented on acting "As long as acting stays fun, I’ll keep doing it. Because, um, we’re all about the fun at this age"
"They smell even worse when they burn, don't they?" "... But surely you've known?!" Just as in the book there are wonderful, powerful scenes in the movie that even now some hours later flood my mind. Vera Farmiga as the mother plays a powerful character, one that conveys the real horror of the situation and anchors it firmly into the reality of the atrocity. Her character is much more potent than I feel the book conveys, and I got a real sense of this German Frau realising just how badly the knowledge that she ignored what was going on around her has hit her. "You could look like me if you wore different clothes and shared your hair off"
And there, for me, was the true atrocity of the situation, the one undeniable truth that makes the whole Holocaust, the senseless murder of so many people and the inexcusable monstrosity of extermination camps like Out-With Auschwitz-Birkenau and Chełmno so intolerable. People died. Children died. Little boys died. As the film drew to its conclusion - a shock to those who hadn't read the book - I couldn't help hoping that this had happened at least once, that somehow, somewhere the lunacy of the entire drama was brought home to them in such a personal way. Like Darren, I can't say I enjoyed the movie but I certainly got the pay-off at the end from the final scenes accompanied by that haunting music. The sounds of tears falling around me indicated that others felt the same. "Of course all this happened a long time ago and nothing like that could ever happen again. Not in this day and age." Read the book. See the movie. Bring children. The lesson should not be forgotten. Thanks to Vincent from Movies.ie for the tickets. You can read other reviews here and watch the trailer here. Wonderful review. Being a fan of the book, was there anything missing for you? I know you had issue with the accents, but apart form that, did it live up to expectations? Boyne said it himself that he felt Herman had made his book better. Maybe he was just being kind under the spotlight. What you think? The soundtrack played such a huge part in the movie. Great in depth, well researched review D. As always! @darren thank you sir. Was anything missing? Well, I don't feel that this was a film OF the book, rather based on the book. In the book Bruno is far more innocent, speaks with an impediment (he calls the camp Out-With) and seems a weaker individual. In the film we know that to be different. Similarly there are parts of the book - the visit of "The Fury" for example that are hugely powerful. However, the film has its own charms - the ending is different, more raw and powerful, the tone harsher and the message stronger. These differences detract from neither book nor film, but highlight the essential differences in the medium and the interpetation. Does that make sense? I don't think Herman made it "better" but he did an outstanding job of making something memorable and something to be proud of. OFTM - thanks for the comment! We had a long discussion about the accents last night - it threw a lot of the movie for me as well, but thinking about it, at least I understood what they were saying and the message was not lost in deciphering subtitles, meandering unauthentic accents or trying to be something that it plainly wasn't. No emphasis is made on the accents and no apologies either. As such, it should do well in America. They certainly missed certain things they could have done IMHO but also they did as much as they could. My niece told me today that they are reading this for school at the moment. I will hopefully get a chance to bring her to see this and get her to write a review over at my place because children are the ones who will truly learn from this. I would dearly love to have been at the premier, but will look forward to seeing it. The music is wonderful. Small little aside - some friend of John Boyne's had me make a mug for the launch party of the book (way back whenever) - I presume he gave the mug to John. That prompted me to go read it the next day. I look forward to your niece's review. Indeed, I think I'd love to see how a child felt after seeing the movie, especially after reading the book. I'll keep an eye out for it! I saw the two lead actors and the director being interviewed on BBC's breakfast show this morning and the clip shown horrified me. Only because I wasn't aware that the roles were played with English accents! Didn't the makers see Life is Beautiful and realise it could still have commercial success and be true to the period and setting? I haven't seen the movie nor read the book but the accents thing would be a big obstacle in whether I go to see it or not. In fact I probably won't as a result. Will read the book instead. But what a stunning promo poster for the movie. So simple yet so effective. Hadn't seen it anywhere until this post so fair play! i loved the book and the way it was written through the boys eyes. the film ifeel lacked the humour of the book, fury for fuhrer and outwith for auchwitz, and also the poignancy of the book was lost with the omisson of bruno referring to his friends back in berlin, as the best in the world. it is only 2 small omissions but i felt it detracted something from the film. i wonder if the author had any say in what was included or left out. i did enjoy the film, bruno and his mother in particular, and the music was perfect for it. What accents did you want them to have? American? Surely not German? Why, then, would they be speaking in English? 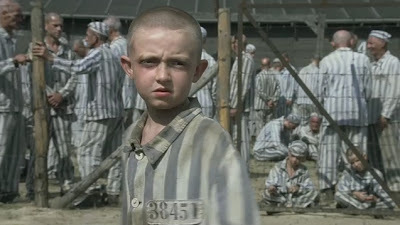 this is a sad movie.......i wished their wasnt a such thing as concentration camps! This was a great book! I cried at the end. I am doing a reaserch paper on him, this seems to be the most exciting thing I have found. Everything comes up with something that says "boy in the stiped pajamas and John Boyne!" it gets boring but to here how cool he is its not really that boring. Hey has written his books and pruduced it in 41 different languages! Nice review! I've seen the Movie yesterday and I've cried like a little Child in the End. I think that this movie is way harder to watch then Schindlers List is. Schindlers List is been told trough the eyes of a Adult. 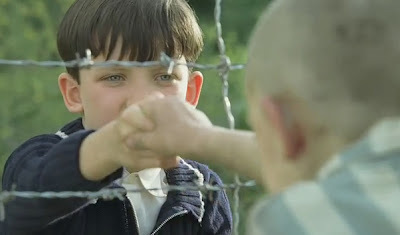 The Boy in the stripped Pyjamas has been told through the eyes of a Child and that makes it really hard to watch. But still it is a great movie, great Actors.